TEGNA and Arby’s Foundation honored us with $10,000 and as one of the top 10 communities in the nation this year! The Wenatchee Valley received its 9th national award as we participated in our 27th Make A Difference Day. We are proud of every single person who personally took on our motto to “see a need, do a good deed.” Thanks for making a difference! Go to our Home Page link: 2017 Projects to see all that was done in communities from Blewett Pass, Leavenworth, Peshastin, Cashmere and the Wenatchee Valley, to Entiat, Malaga, Waterville, and Quincy. You are amazing! Total funds raised during the 2017 Make A Difference Day: $83,772.35. 118 businesses, sponsors, and venues were a part of Make A Difference Day. 13 grants of $200 each were awarded to 13 groups for 2017 projects. 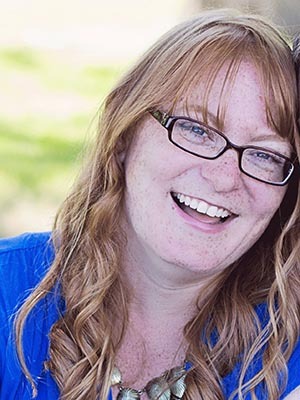 These grants came out of a fund at the North Central Washington Foundation established with prize monies from previous years’ Make A Difference Day entries. This is just one of the amazing projects that happened in our area on Make A Difference Day 2016. Those voices were heard coast-to-coast as an estimated 3 million volunteers spent the 22nd Make a Difference Day helping their communities in every way imaginable. 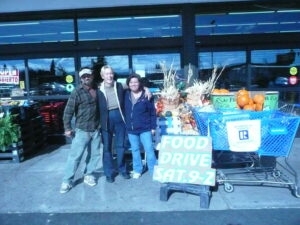 And in North Central Washington, the award-winning tradition of doing good on the fourth Saturday of October continued. There were 76 documented projects up and down the Greater Wenatchee Valley reported as far as Quincy, Leavenworth, and Entiat. New projects began and projects that have been in the works for years continued as the day provided a means to “see a need, do a good deed,” The grassroots effort provides a day to plug in and work for something greater than self, organizers reported. It is the nation’s largest day of service, and for local community members, it is an opportunity to join hands with others who want to better the place they live in and strengthen the place they call home. NCW pitched in on the 21st Make A Difference Day, Saturday, Oct. 22, 2011. From Douglas Creek to downtown, we saw an estimated 7,000 participants in projects large and small helping youth, the elderly, animals, health/welfare and the environment. Volunteers started the day in the rain working on over 60 projects, but by mid-morning the sun was shining and many projects were complete. Only 2 projects were reported postponed. By the end of the day, communities around North Central Washington were cleaner, stronger and better to live in. 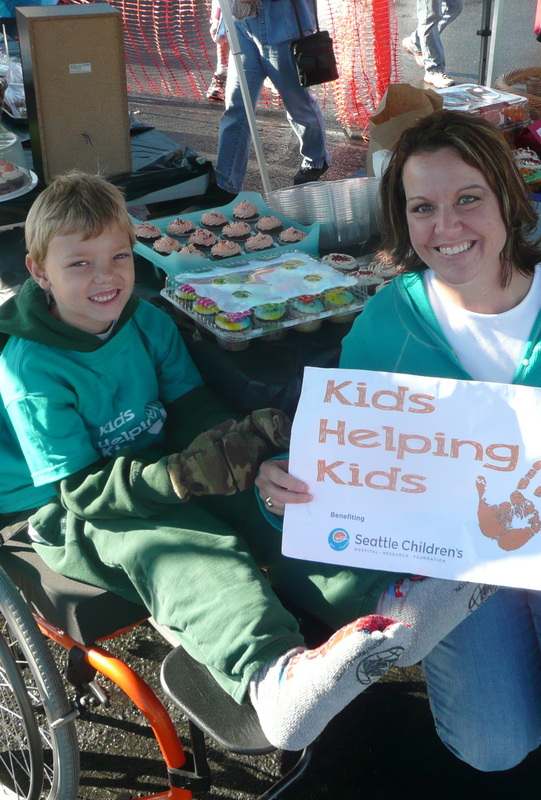 Most visible was a huge group of kids and parents who waved signs along Grant Road in East Wenatchee, selling baked goods to benefit Seattle Children’s Hospital. Realtors were out in full force collecting for food banks. Headers for Haiti continued collecting soccer equipment at several locations including at the last home game for the Wenatchee High School senior who started the project. The Coats for Kids first time Make A Difference Day project kicked off a year-round coat drive with collection points including the Wenatchee Valley Mall. Alcoa workers participated in several projects during their month-long service blitz, and skateboarders gave a public demonstration of their newest tricks at Pioneer Park. Soup was served to seniors at Colonial Vista and emergency preparation was practiced at Pangborn Airport. Habitat for Humanity was spotlighted and served, as was the Hospitality House, Mustard Seed, Humane Society, CASA, New Life Adoptions, Art on the Avenues, Women’s Resource Center, Salvation Army, Wellness Place, Cancer Care, Homeless Education Program, Teachers Make A Difference, Share a Bear, Catholic Family and Child Services/Volunteer Chore Services, and Haven of Hope. Quilts of Valor were on display, Town Auto Groups sorted and shelved the 13,000 pounds of food they collected for Serve Wenatchee Valley, students from many schools volunteered in numerous projects, and the Ski Swap at Orchard Middle School continued to be a huge draw. Piano students played for nursing home residents, Leavenworth Rotary collected bicycles for Bikes for Humanity, pediatric dentists collected funds for Operation Smile, Missio Dei Church volunteered for the Red Cross, and a candlelight vigil was held to take a stand against child abuse. Projects were reported at Entiat’s Senior Center, in Cashmere, at Zanika Lache at Lake Wenatchee, at Trusting Spirit Horse Rescue at Orondo, and in Chelan’s Riverfront Park. 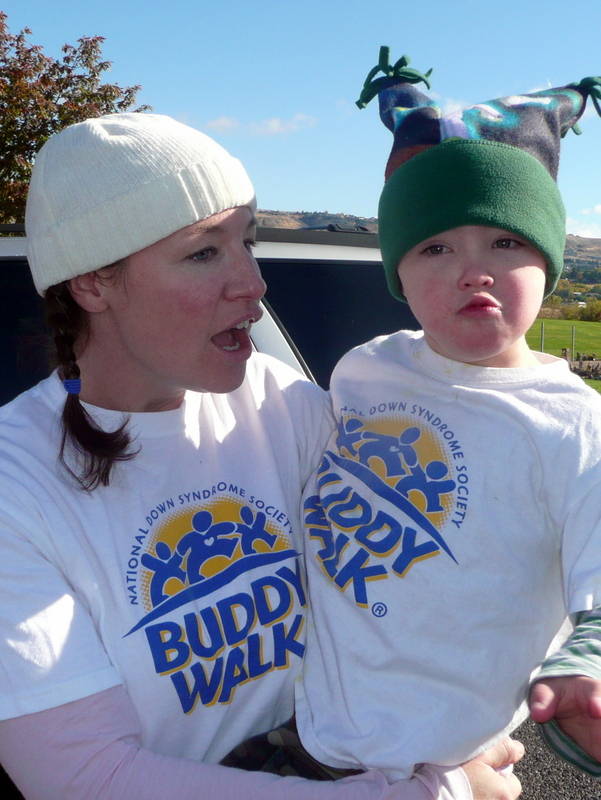 A family traveled from Twisp to walk with others in the sunshine at the Buddy Walk for Down Syndrome Awareness at Walla Walla Park in Wenatchee. We must mention all those who did the untold and unreported good deeds during the day. Large and small – we thank you all! Big news! The Greater Wenatchee Valley was honored with a 2011 Encore Award of $10,000 for our efforts in 2010! It was our 20th Make A Difference Day. On Make A Difference Day, Saturday, Oct. 23, 2010, we saw an estimated 8,000 people participate in projects large and small. Of those nearly 80 projects reported to the website we addressed needs for youth, the elderly, animals, health/welfare, and the environment. Many of the planned projects saw their numbers increase dramatically such as the park walk to promote awareness of Down Syndrome which tripled its numbers from last year to nearly 200 walkers. Or the barbecue dinner project which sold 167 meals (up from 76 last year) to fund foster child adoptions. The annual ski swap which benefits a middle school and the local ski team was the most successful ever and raised more than $6,000 as well as provided affordable equipment to hundreds. The walls were raised on a one-time project to build a home for a man paralyzed in a bike accident. Ohme Gardens, our community’s public garden, had 46 volunteers donate 163 hours in hard maintenance work, lawn work, and a kiosk completed. Trusting Spirit Horse Rescue saw 53 people build a new pen, install fencing and more, calling it the best day ever! AVID members from Orchard Middle School repeated their Blanket Patrol and collected warm items for patrolmen to keep in their trunks for the needy. The fall weather brought out groups like the WHS freshman football team and Americorps to clean up parks and youth camps around the area. The artwork around Wenatchee got a good cleaning. The NCW Realtors annual food drive was a resounding success. A huge coat and clothing giveaway was organized by Serve Wenatchee Valley. Rotary collected books for the Reach Out and Read project. The Hat Project collected yarn and money. A large group from The Church of Jesus Christ of Latter-day Saints traveled to Brewster to clean up the riverfront. Projects also happened spontaneously such as the employee group that cleaned an apartment building damaged by fire/smoke where an elderly resident died in late September. Or the friend of a longtime meter maid-cancer patient who raised $2,740.10 standing at the community fountain. Or nearly one hundred people from Wenatchee who drove over an hour to Brewster to clean their riverfront. Hundreds turned out for free concerts and free giveaways. Many more projects continue to be reported after MADD such as the 5th grade boy who raised $2,300 for another school’s library which did not have a PTSA. And the Master Gardeners who got together to plant an exhibition garden. And the football teams that turned out to work in parks. And the men who prepared the foundation for the new Little League snack shack. The good done in one day – reported officially or not – is incredible. Make A Difference Day is our rallying point. A day we can depend on. 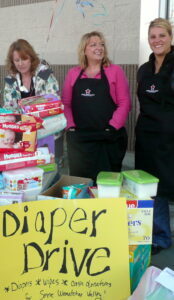 The Junior Service League is talking about turning their Make A Difference Day diaper drive into a year-long project. The Homeless Education Program at Eastmont School District had a woman commit on Make A Difference Day to buying a coat for any needy child anytime during the coming year – and she’s already bought several through the program! The day gives everyone a way to give. We decided to do this because we believe everyone – young or old, rich or poor – has something to give and can do something to make the place they live a little better. For 20 Make A Difference Days (the Wenatchee Valley did two in 1992) we’ve been doing it and we will continue as long as people in this valley love and nurture the idea. In 2009, we joined over 3 million people nationwide who turned out to help others in the nation’s largest day of volunteering. An estimated 8,000 of us in North Central Washington got out early on Oct. 24 and worked on projects throughout the Greater Wenatchee Valley, Cashmere, Leavenworth, Entiat and in Columbia Basin communities like Quincy. Others volunteered dollars, donations and voices of support. On our 19th annual Make a Difference Day, folks spent their morning cleaning, painting, repairing, building, mowing and planting, while others collected food, blankets, bikes, diapers, clothes and scores of other items ? all to better the lives of people they don’t even know. Then, after lunch, many of the volunteers moved to new locations and repeated the efforts through most of the afternoon. Food bank donations were double the amount from last year. One collection spot run by the NCW Association of Realtors at Grocery Outlet in Wenatchee pulled in more than 3,600 pounds of food and raised nearly $4,000 for food banks in Wenatchee, Leavenworth and Entiat. And other collection sites ? for food, blankets and other items ? had similar success. At Clear Lake, about a mile up from Stemilt Loop Road south of Wenatchee, a group of more than two dozen geocachers from as far away as Tri-Cities and Federal Way scoured the lake’s banks for litter and debris. They filled a pickup with 24 extra-large plastic trash bags packed with beer bottles, cans, paper and a few camp stove propane tanks. A clean-up program called CITO ? Cache In, Trash Out ? is part of every geocache outing. It was a natural for Make a Difference Day. At Wenatchee’s YWCA, more than 40 volunteers attacked several large projects that included re-roofing the building’s entry dormers and spiffing up a remodeled basement space for the new CafÃ¨ AZ which opened in the spring of 2010. Volunteers also cleaned carpets and windows throughout the YWCA building and sorted and priced clothing in the group’s retail boutique. The day ended with a volunteer-run silent auction of donated items. Up on the roof, Rene Albarado, owner of NW Extreme Roofing, said he and his crew try to squeeze in volunteer work year-round to benefit local charity groups. Several businesses like his made sure they were helping in the community on Make a Difference Day. In Quincy, hundreds of people turned out to support efforts to build a new library, said local Make a Difference Day organizer Bonnie Kniveton. A Saturday night event ? Beer, Brats, Bonfire & Band ? at the Twin Firs Turf farm drew supporters from around the Quincy Valley for a five-hour fundraiser party that included food and music. A downtown site in Quincy has been chosen for the new library, but construction has yet to start. Back in Wenatchee, The Hat Lady, Aida Bound, collected items at the Wenatchee Community Center to make hats for needy children under 7. Also at the center, a community garden was put in by Orchard Middle School students and folks stopped by to clean the outside up. The students also collected blankets for the Wenatchee Police Department to keep in the trunks of their patrol cars. A delicious soup supper was served to the community at Colonial Vista Retirement Center and the proceeds were donated to the Salvation Army Food Bank. The Salvation Army Shelter got a spiff-up inside and out. So did Camp Zanika Lache with the help of nearly 100 volunteers. Ohme Gardens and the Cooperative Extension Master Gardeners organized work parties, and a youth group from the Church of Jesus Christ of Latter-Day Saints pumped gas “For a Cure” for cancer at Safeway. Christmas stockings were made and donated to CASA and construction of a gathering place was begun. Antioch Adoptions had a successful fundraising barbecue. Teams from the Red Cross went door-to-door promoting residential fire safety. A large group of volunteers – from Girl Scouts to individuals who just have community pride – turned out to paint over graffiti with the Police Department. The community sculptures were cleaned for the winter, the horse corrals at Trusting Spirit Horse Rescue were winterized, piano students gave concerts in several locations, Wenatchee School District Homeless Education Dept. collected school supplies and money, teddy bears were donated to the Share-a-Bear project, books celebrating teachers were sold, and bikes were given away through the long-standing repair project by an East Wenatchee custodian. Trails in the area were also improved through the Chelan-Douglas Land Trust, and a huge diaper collection was completed by the Junior Service League. The City of East Wenatchee and the City of Wenatchee gathered volunteers to improve public places, the Mustard Seed Neighborhood Center spiffed up the outside, and the annual Ski Swap at Orchard Middle School pulled in a large profit for the PTSA. Grace Lutheran Church helped Habitat for Humanity as well as assisted Catholic Family and Child Services families in a mobile home park. Cub Scouts and Boy Scouts collected food. The Lions Club and a group of educators cleaned up areas along the highway. The annual giveaway at Foothills Foursquare Church had lines around the building waiting to get in. This is not everything… but it sure is something! Volunteering is contagious, and we hope that even more of us catch the spirit and take the opportunity to pay it forward. Please join us in 2010 in making our communities a better place to live. Well Done! Opportunities to Make a Difference abounded on Saturday, Oct. 25, 2008, with over 70 community projects taking place across North Central Washington, as well as the many unheralded “good deeds” performed by individuals. There was painting, park maintenance, diaper and food bank donation drives, a cancer fundraiser and concerts. Chuck Peters, owner of Rain Shadow Gutters in Cashmere, installed gutters for low-income people in six homes. Ohme Gardens – “our community’s garden” – was spiffed up; Sheri Smith’s 2nd graders at Washington Elementary School made cards and wrote encouraging letters to Central Washington Hospital; Cub Scouts and Realtors collected food for the hungry. Habitat for Humanity volunteers improved housing for low-income residents. Geocachers cleaned up. Rotary Clubs unified to improve our parks, piano students played at several area nursing homes, and the Lions and Kiwanis collected eyeglasses and money for their projects. Money was also collected for a memorial statue for teacher Josh Putnam at Lee Elementary School. Volunteer Chore Services assisted individual families. 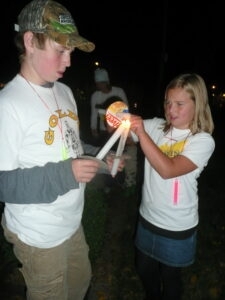 The area’s largest ski swap was held, benefiting Orchard Middle School PTSA. Our House/Cancer Care collected items, bikes were repaired/given away at Kenroy Elementary by Cascade Elementary custodian Chuck Riibe and his crew, and the annual Make a Difference Day Giveaway offered thousands of household items for free at the Foothills Foursquare Church. Christmas stockings were made for foster children and care packages were made for our troops. Coats and winter items were collected by Riverview Kiwanis and food was gathered for animals and people. The trails at Horse Lake were improved, sculptures were cleaned around town, and the Mustard Seed Neighborhood Center was prepared for winter. The day ended with two community concerts which benefited handicapped 4-H children and the African children’s chorus. 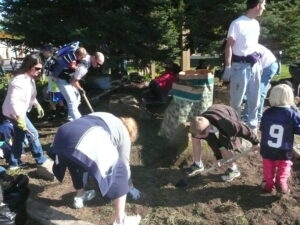 In 2007, thousands of people took part in the 17th annual Make A Difference Day in the Wenatchee Valley, the Columbia Basin, and the Upper Valley. 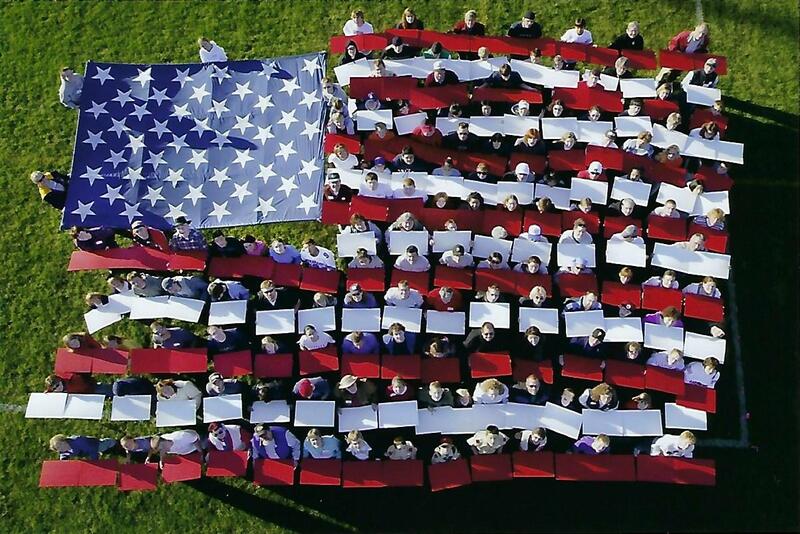 They joined over 3 million people who cared enough about their communities to volunteer on that day (Oct. 27, 2007)! In North Central Washington, the national day of helping others ? a celebration of neighbors helping neighbors ? 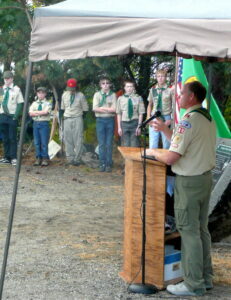 saw projects ranging from improving hiking trails to cleaning up parks. There were book sales and food collections. Animals were fed and summer camps were winterized. Homeless men and women were re-supplied with food, shelter and the necessities of life. Kids received fixed-up bicycles. Homes of the elderly were made more livable. Christmas stockings were sewn for children in foster care. Those with cancer were remembered and rejuvenated. Rocks were cleared from softball fields. 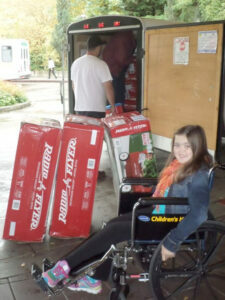 Over 100 teddy bears were donated, as well as eyeglasses, medical equipment, and games for children. It was truly a day that everyone can participate in ? and so many did! Old, young and in-between joined hands and made the place we live in a little better. Thanks for making a difference in 2006! Our theme, ‘The difference is YOU!’ inspired dozens of projects. Projects in the Greater Wenatchee Valley flourished as new and longtime supporters of the idea to ‘make a difference in our community or the lives of the people in it’ completed projects. 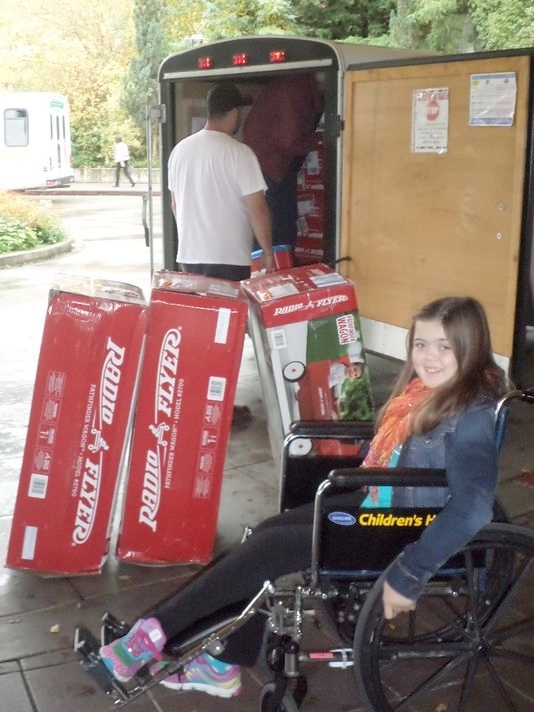 Clubs, churches, organizations and neighbors saw a way to do a good deed… large and small. They included new projects like cleaning out stalls for orphaned horses at the Trusting Spirit Horse Rescue in Orondo. 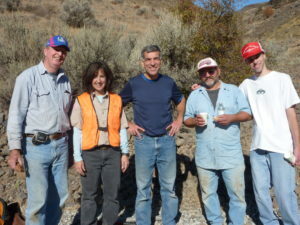 Trail work was done around the Wenatchee Valley and Rotary clubs cleaned up parks. Bikes were collected for kids, the Bruce Hotel was spiffed up, chores were done for the elderly through Catholic Family and Child Services, and Camp Fire’s Camp Zanika Lache was winterized. Books, eyeglasses, teddy bears, childrens’ games, medical supplies and items for families in need were collected and given away. Child restraint seats were inspected, skis were sold for school PTSA funds, and daycare centers cleaned. ‘Teachers Make a Difference #5,’ a book highlighting the great educators in our lives, was published with proceeds going toward scholarships. What more was done? Those who participated in quiet ways and those who benefited know and felt the power of joining hands in a day of service. We are looking forward to 2007. 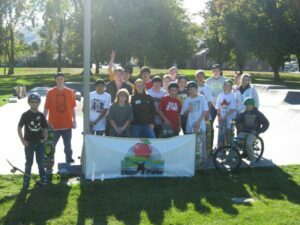 North Central Washington joined hands to Make a Difference with Prepare and Sharein 2005. From Entiat to Cashmere, from Moses Lake to the Wenatchee Valley, thousands helped their neighborhoods improve. More than 50 projects involved volunteers of all ages. Disaster relief was the focus for several large projects including an effort to help a school in Mississippi hit by Hurricane Katrina and relief for the countries hit by the recent tsunami. Local preparedness was targeted at the community fairs and The Wenatchee World distributed important information and checklists in the daily newspaper. Other events included clean-ups, mentoring programs, concerts, Christmas stockings for foster children, painting a flag pole and a ‘free’ yard sale. Collections included pet supplies, food, cans, teddy bears, school supplies and eye glasses. An injured returning veteran was helped when Rotary finished building his home for his family. It was another successful year of building strong families and strong communities. Our 14th year of celebrating Make a Difference Day and nearly 50 projects where done in the Wenatchee Valley. 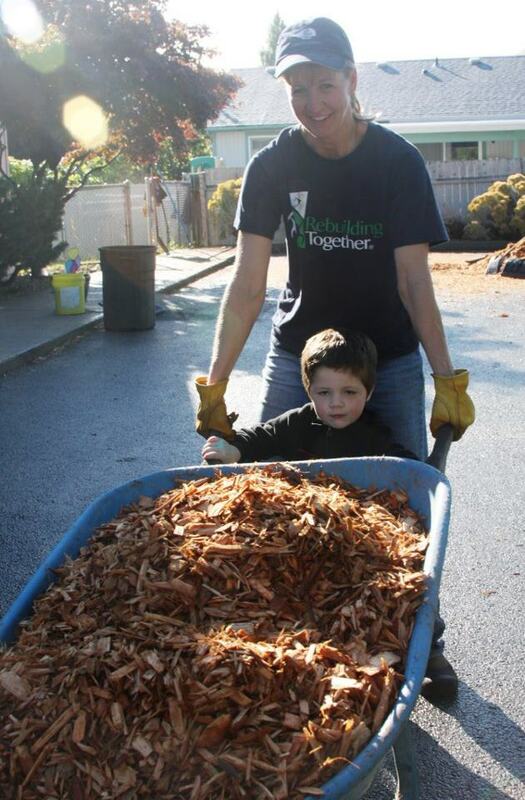 Everything from annual cleanups to food drives and more. The Wenatchee Valley’s commitment to making a difference lives strong. Our 13th year of celebrating Make a Difference Day was truly a showing of ‘What a Difference a Day Makes’. 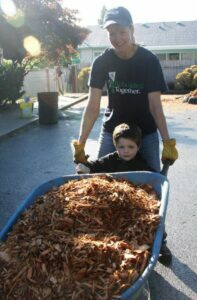 Over 17,000 volunteers, of all ages and abilities, spent the day doing good deeds for others. Some of the events included a bone marrow donor drive, building a storage shed for the Humane Society, Boy Scouts and Realtors joining together to collect canned goods, providing school supplies to children in need, free flu shots, park clean-ups, and music students sharing their talents with senior citizens. Of course the list was much, much longer than can be shared here. Let it suffice to say that unique and industrious projects succeeded in ‘Making a Difference’ throughout the Wenatchee Valley in 2004. 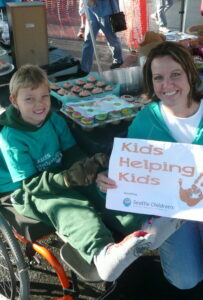 More than 15,000 people took part in Make A Difference Day, led by Margie Kerr and Laurel Helton. The community effort earned a fifth national award from USA Weekend magazine. 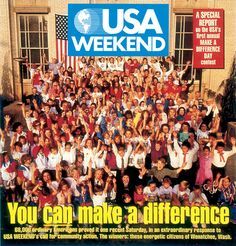 From USA Weekend Magazine on Winning the Encore Award for 2002:On the very first Make A Difference Day, 1,000 volunteers came together in this valley at the request of organizer Margie Kerr and her sister Betsy Tontini, whose Make A Difference mantra was: “It’s the unity in community that gets the job done.” Volunteers worked on Habitat for Humanity homes, cleaned Riverfront Park, washed puppies at the Humane Society and recruited Big Brothers and Big Sisters. For their impact and imagination, these volunteers received the first National Make A Difference Day Award. It included a $1,000 donation that was used to set up a hot line to give volunteer referrals. And that hot line has been buzzing ever since. So has the Make A Difference Day volunteerism. The Greater Wenatchee Valley received previous “Encore Awards” for outstanding Make A Difference Day efforts in 1995, 1997 and 1998 as well as an “honorable mention” for work in 1994. The extraordinary action continued even after Betsy Tontini died several years ago. Now, Margie plans the day’s events with Laurel Helton. Oct. 26, 2002, on the 12th National Make A Difference Day, Laurel and Margie helped orchestrate 25,143 volunteers — about half of the valley’s population — in more than 180 projects. — A YMCA aerobics instructor, herself struggling financially, mobilized 100 Y members to donate goods to a women’s shelter. — A radiologist gave free mammograms to uninsured women. — A music teacher enlisted the entire statewide music teachers’ association to hold piano recitals at nursing homes on Make A Difference Day. Result: 274 piano students around the state made music for seniors. — All 500 students at Washington Elementary School reached out to the soldiers at Prince Sultan Air Force Base in Saudi Arabia. The kids sent “thank you” letters as well as tea, coffee and dinner place mats for Thanksgiving — all from supplies donated by merchants and parents. 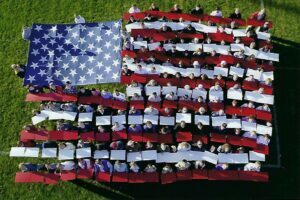 In an unexpected outpouring, the service men and women sent back letters, e-mails and even two American flags flown on air missions over Iraq. And the base continues to thank the children for caring. — There were scores of collections, cleanups and community awareness programs, and a virtually uncountable number of unsung individual acts, including this one submitted on a Post-It note: “A lady has been cleaning up the parking lot of a church in East Wenatchee and wants to remain anonymous.” In the final tally, caring citizens helped more than 100,000 people that day. The $10,000 Make A Difference Day 2003 Encore Award, funded by USA WEEKEND Magazine and the Gannett Foundation, will benefit the Community Foundation of North Central Washington. Greater Wenatchee’s 1999 Make A Difference Day began with a bang! United Way hosted a pancake breakfast for all volunteers. Great announcements such as the awards of the Kids First Grants took place at the event also. Many of the community agencies hosted open houses and sent out a wish list flyer. Nearly all of the agencies’ requests were fulfilled by community members and organizations. 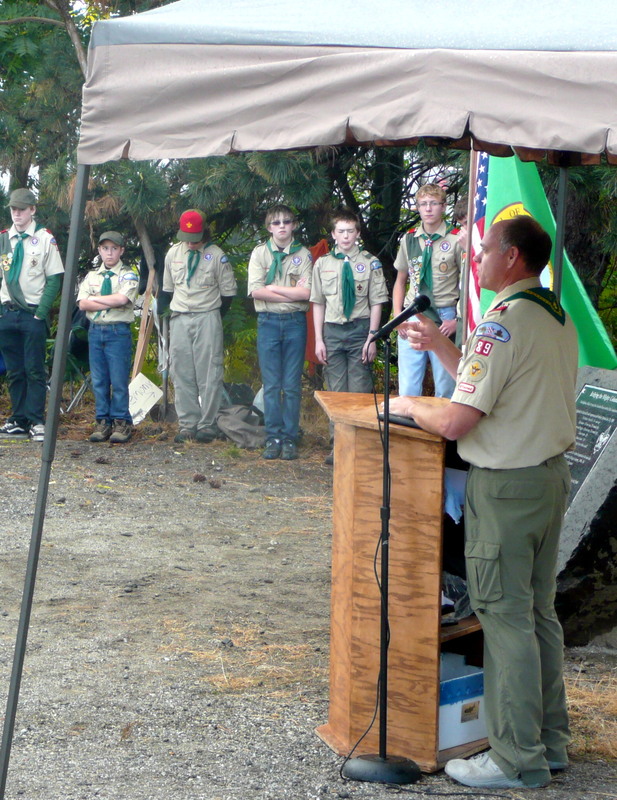 A landscaped park was completed in East Wenatchee by more than three dozen volunteers. Lincoln School began the beautification of the Park-N-Ride near the South End bridge. Washington State Patrol, Wenatchee Police Department, and State Farm Insurance teamed up to provide a Child Safety Seat inspection and Child ID packet at ShopKo parking lot. Throughout the valley, community service could be seen! Great Job! Four-Time National Award Winners! In April 1999, the greater Wenatchee Valley received its third Encore and fourth national award for the October 1998 Make a Difference Day projects. The 1998 Theme: It’s the ‘Unity in Community’ That Makes the Difference. The Wenatchee Valley Make a Difference Day Committee will receive 41,000, which will go to the Community Resource Consortium, a group of agencies and organizations from KIDS FIRST! to Goodwill Industries. The consortium, which is seeking to connect people to community resources and volunteer opportunities, will use the money to build an Internet Web site listing community resources in Chelan, Douglas, Okanogan, Grant, Adams and Lincoln counties. During the 1998 project, Wenatchee Valley residents undertook more than 100 projects, ranging from cleaning up garbage to collecting food. The Greater Wenatchee Valley Make a Difference Day Committee once again organized a concentrated effort for the October 25, 1997, Make a Difference Day. The committee planned a variety of projects for the day, highlighted by neighborhood improvement projects and a visit from Hedda Sharapan from Mr. Rogers’ Neighborhood. Hedda was in Wenatchee Friday morning, October 24, to present information on Death and Dying. This workshop was sponsored by Telford’s Funeral Home in East Wenatchee and Jones and Jones Funeral Home in Wenatchee and was for parents, counselors and educators who wanted to learn to help children deal with death. Friday night Hedda gave a workshop dealing with teaching children and teenagers to become responsible community members. Hedda delivered the ‘kick-off’ speech at the Make a Difference Day breakfast, followed by ‘Building a Neighborhood out of Boxes,’ limited to 50 families. The theme, A Community of Neighbors, was adopted for the 1996 year efforts. On October 26, 1996, volunteers completed over 150 separate projects, collected 184 children’s coats and delivered just over 300 pounds of canned food to needy families. Other projects included: repairing bikes and donating them to needy children and individuals; the local Camp Fire Girls packaged Food Bank Soup Bags; area clean-ups; and Habitat for Humanity construction. In 1995, the Wenatchee Valley was recognized with an ‘Encore Award.’ The successful completion of a huge project in lighting the Columbia River Pedestrian Bridge was the central focus of that year’s effort. The Wenatchee Valley community has also received an honorable mention award in the past. The 1995 theme, Bridging the generations: Making a difference in our community,brought together hundreds of young and old alike. The Make A Difference Day project linked hands in service to others for over a hundred community endeavors. The youngest known volunteer was five and the most senior, just over 85 years of age. Many projects were designed to link all age levels, all ethnic groups and all economic family conditions.